Click on the letter to see the definitions and explanations of words that you want to know about. There's nothing in here that will upset or surprise you. You can't expect to know the language of flying, and in aviation we sometimes use words differently from the way we use them in everyday life. So don't be reluctant to use this dictionary to help you to understand the world of aviation. Abnormal; Something that is outside the normal operation of the aircraft but which does not constitute an immediate danger. Aborted landing; Correctly called a go around. The process where an aircraft climbs away after the decision has been taken not to land. Acceleration height; The height at which the pilot reduces power and the rate of climb to accelerate and starts to retract the flaps. Acceleration; The process of changing speed with respect to a direction. Adrenaline; Chemical produced by the body to enhance performance in fearful situations. Agoraphobia; The fear of open spaces. Aileron; The movable surface on the wings, which allow the pilot to bank or turn the aircraft. Situated at the ends of each wing. Air traffic; Airborne traffic and any flying machine either flying or preparing to fly or after flight until the engines have been stopped. Airborne; The time the aircraft … (Premium) …flight. Air-conditioning; The system on board, which provides clean air to a predetermined temperature. Airflow; In effect the ‘wind’ which an aircraft is subjected to because of its movement. Airplane; A heavier than air vehicle which supports itself with fixed wings. 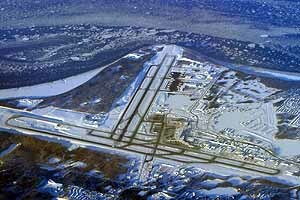 Airport; An area set-aside for the navigation of flying machines. Airworthiness Certificate; The authority to fly, given to an aircraft jointly by the manufacturer or airline airworthiness authority and aviation authority of the country. Alcohol; A drink which dehydrates the body. NOT RECOMMENDED FOR ANXIOUS PASSENGERS. Altimeter; Instrument showing … (Premium). Altitude; Height in feet or metres above a specified datum. i.e. Sea level. Height is referred to as being above the airport. 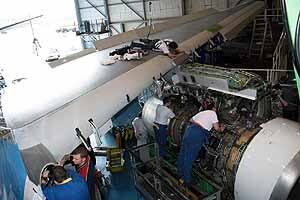 Assessment; Process by which crew are measured in their technical and behavioural techniques. Autoland; A landing which is controlled solely by the automatic pilots and is monitored by the pilots. Aviation authority; A government body approved by the international agency responsible for aerial navigation. Aviation Fuel; On small propeller driven aircraft is very similar to car petrol, diesel fuel is now being used on aircraft fitted with diesel engines. Jet fuel is sometines known as Avgas. It freezes at about -40 C.
Anxiety; Feelings produced by fear. Baggage; Luggage which is legally entitled to be on board and which has been inspected prior to loading and which is recorded on the ships papers. Balloon; Heavier/lighter than air flying machine which ascends and descends according to the amount of hot air in it. Beacon; A radio transmitter that sends out signals to assist in the navigation of aircraft. They can send different sorts of information such as bearings position lines or distances. Behaviour; What someone does in response to thought and emotion. Wilbur Wright one of the two brothers who made the first powered flight was asked to give a speech at a dinner in their honour, he rose and said ” I know of only one other bird that flies and talks…and that’s a parrot…and it doesn’t fly too well.” and promptly sat down. Blind landing; Landing done by the automatic pilot without reference to … (Premium) Bulkhead; Partition placed between different classes of passengers. Bulkhead 2; Part of the aircraft separating one area from another … typically the pressurised areas from the un-pressurised areas. Cabin crew; Members of the crew whose legal duty is to deal with emergencies in the cabin and to ensure that all the activities in the cabin maintain the required safety levels. Caffeine; Ingredient of many drinks … unhelpful to most nervous flyers. Cargo holds; Designated areas where unsupervised articles are secured which have independent smoke and fire protection from the rest of the aircraft. 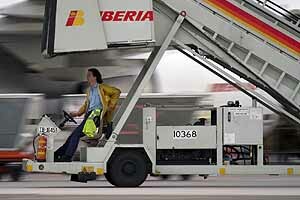 Cargo; Non permanent articles on board, carried under strict security rules and secured in approved locations on the aircraft. Catastrophising; Assuming the worst outcome for any event. Catering; The supply of food and drinking supplies to an aircraft. Centre Line; The markings and position on the runway which … (Premium) Check; In engineering this refers to a scheduled maintenance procedure. Check; For pilots this means a statutory test of competence either in … (Premium) Check-in; The process of recording the names of passengers and baggage weights prior to flight. This is a legally required procedure. Checks; Pilot slang for competency tests. 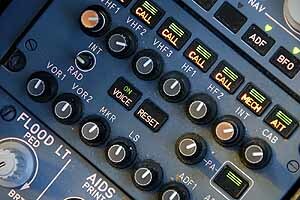 Checks; Procedures that set the aircraft for a particular stage or state of flight. Children; Persons who are under a specified age limit. Circadian rhythm; The body’s inbuilt time clock for sleep and activity … it is a 25 hour cycle. Claustrophobia; The fear of being in an enclosed space. A characteristic of many fearful flyers. 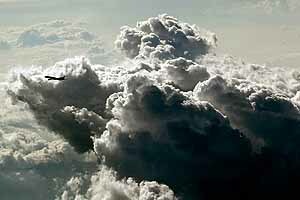 Clear air turbulence; Turbulence which is caused by … (Premium) … cloud. Climbing; The period when an aircraft is gaining altitude. Cloud; The result of water condensing into visible moisture caused by rising air. Clusters; Groups of fearful thoughts. For example the thought that turbulence … (Premium) … that you might be air sick. Cockpit. Place where the piloting crew are seated and where all the controls necessary for flight are located. Now called the flight deck. Cognitive dissonance; The interaction of conflicting information. Not immediately obvious. Cognitive therapy. Therapy based on thinking processes leading to behavioural changes. Compass; Instrument for showing direction. These can vary from a … (Premium) …in a glass cockpit. Competency test; The six-monthly tests for pilots to ensure … (Premium) … abnormal situations. Compressors; Motors or a system attached to the engines (or by a gearbox) that compresses air to maintain temperature and pressure within the aircraft. Condensation trail; The white trail left in the sky behind a highflying aircraft caused by water vapour in the exhaust freezing as it leaves the engine. Configuration; The way the aircraft is set … (Premium) …wheel position. Confirmation bias; The process of finding and using information that confirms what you think. Conflicting traffic; Air traffic movement which … (Premium) … ATC requesting a change of direction speed or altitude for one of the aircraft involved. 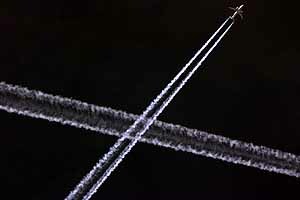 Contrail; Same as condensation trail. Control column; The steering wheel in the flight deck. Cirrus; High level cloud consisting of ice crystals. Control Tower; The building on an airport where… (Premium) … if not all of the airfield. Copilot; A qualified pilot who is … (Premium) …the captain. Coping imagery; Thinking of a beneficial outcome or mental images to divert attention from the surrounding environment. Crew meals; Food specifically allocated to crew members and for the pilots are different types of food. 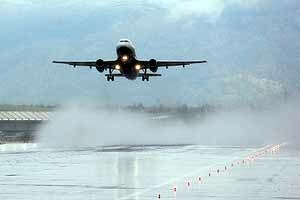 Crosswind; A wind that blows at an angle to the required direction of travel. Cruising level; The height at which it is most… (Premium) … the weight of the aircraft and the speed temperature and direction of the air it is flying in. 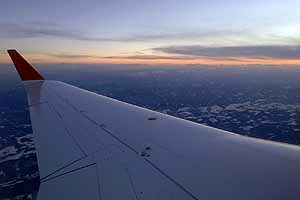 Cruising; The part of the flight where the … (Premium) … maximum height achieved during the flight. Cumulonimbus; Clouds that have developed from … (Premium) …Hence the expression. Cumulus; Clouds formed by rising air. Look white and fluffy. Contain approximately … (Premium) …water! Defense; A procedure for minimizing the effects of a threat. De-pressurisation; When the air pressure inside the cabin … (Premium) … leaking air. Overcome by … (Premium) … lower altitude. Disembarking; The legal process when the passengers leave the aircraft. Disorientation; The effect of conflicting information … (Premium) … passengers when the aircraft changes speed or attitude and cannot be confirmed by visual information. Distractions; Any process by which thoughts can be directed away from their source towards another subject. Diversion Fuel; The extra fuel … (Premium) … diversion. Diversion; The process of flying to an airport other than the intended destination. Doors to automatic; A request to cabin crew to set the normal passenger entry doors to a position so that in the event … (Premium) … automatically deploy. Doors to manual; Call made by a crew member to set the door so that when it is opened the escape slides DO NOT deploy. 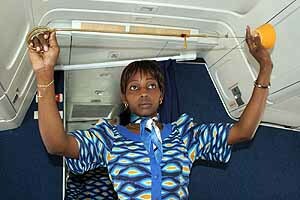 Doors; Aircraft have different types of doors depending upon the general design of the aircraft. Plug doors open … (Premium) … into a sink. It is too big to pass through the opening. Other doors are outward … (Premium) …that prevents the door from … (Premium) … maintain air tightness around the edges of the doors to maintain cabin pressure. Downdraft; Meteorological term for air that descends quickly over a short time and area. Drag; Is the resistance to the planes movement caused by the thickness or ‘stickiness’ of the air it is moving through. Drift; The angle between the weight and aircraft is pointing and the way it is traveling. Duty; The legal period of time when a crew is allocated to be working or is working or has worked. Electrics; Pilots expression for the electrical system on … (Premium) … each engine and a battery, plus back up systems. The APU produces electrical power. Elevator; The control which alters the pitch angle of the aircraft. Raises or lowers the nose position relative to the plane’s axis. Emergency; A situation requiring defined actions within an immediate and short time scale. Emotion; Feelings brought about by thoughts. Engine; Aircraft have piston jet or turboprop engines. Piston engines are like car engines (some are diesel) Jet engines are the ones t… (Premium) …benefits of propeller driven aircraft. Expectation; The expected result after a course of action. Experience; For pilots is measured in hours of airborne flight time. Fatigue; A medical situation where mental and physical processes are diminished. It is not excessive tiredness. Cannot be overcome by more sleep. Fear of flying; Worry and anxiety about flying caused by thoughts or experiences. Flaps down; When the flap system is progressively extended to increase the area of the wings for low-speed flight. 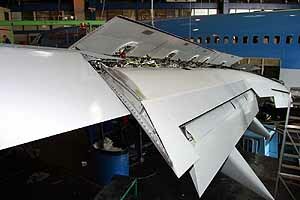 Flaps up; When the flaps are inside the wings of the aircraft or forming a part of the normal shape of the wing. Flaps. Extensions of the wings to make the wing area greater. They normally come out and then down to make the wings more curved. Flight plan; The coded message required before an aircraft can use certain classes of airspace. It records; Aircraft type, speed, route, duration of flight, fuel on board, reserve fuel available, emergency equipment carried, pilots name, cruising altitude etc. Food poisoning; Caused by contaminated food … generally reveals itself within 4 or 24 hours of the poisoned food being eaten. 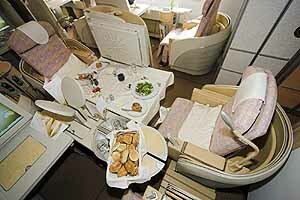 Minimised in aircrews by controlled catering and rules. Phobia; An exaggerated and irrational fear. Fuel reserves; The onboard fuel specifically allocated … (Premium) … route. Fuel Specification; The legally required fuel applicable to an aircraft engines with regard to its type, density, flashpoint and freezing point. Fuel tank; Passenger aircraft have multiple tanks and usually have to have individual tanks to supply each engine. Often fitted with internal fuel pumps. Fuel can be … (Premium) … purposes. Flight instrument indications; The information shown to the pilot via the instruments to show the aircraft’s performance and position. G.M.T; Greenwich Mean Time The time in any part of the world referenced to Greenwich. The zero degrees longitude position on the earth’s surface. It runs through London. 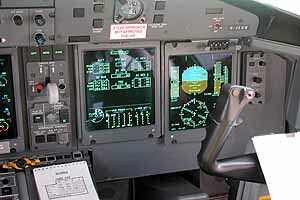 Glass cockpit; A cockpit where information is presented to the pilot in digitised form via computer image processing. 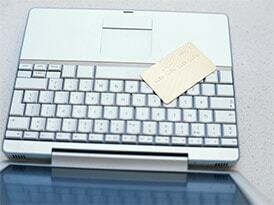 The advantage is the space saving … (Premium) … The information is presented on multi functional screens. 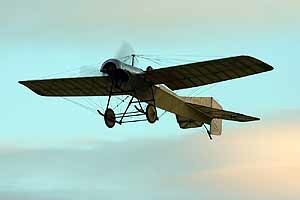 Glider; A flying machine without an engine but with wings to provide lift. Globalization; The mental process of believing that an isolated incident is common. Go around; The correct term for an aborted landing or overshoot. GPS; Global Positioning System. A navigation system based on the satellite positioning system. This is not commonly used in civil aircraft. Gyroscope. A spinning wheel which by virtue of its construction can spin at a very high speed to enable anything attached to, to maintain a steady position. Now replaced in aircraft instruments by laser shift measuring prisms. Geostrophic Wind Effect; The change of wind direction because of the rotation of the earth. Hailstones; Very large and frozen water droplets sufficiently heavy … (Premium) … aircraft, except on the nose cone. Headwind; A wind slowing the progress of an aircraft over the ground. Hereditary; Traits as a result of genetic programming…can be a cause of a fear of flying although it is more likely to be a general trend of ‘nervous sensitivity’. Heuristic; A well used shortcut to solving problems but has the shortcoming of relying on ‘the usual’ and ‘familiar’. Most popular useage is ‘the availability heuristic’ meaning first to mind. Holding; The process of maintaining position while waiting to be given permission to continue the flight. Hydraulic failure; The event where one or more systems fails to operate in the expected way. This can mean … (Premium) …… (Premium) … can be provided by electrical pumps or airflow driven generators. See RAT. Hydraulic system; The system which is able to supply hydraulic power from a sourse along a route to activate a piece of equipment. A commercial aircraft will have … (Premium) … others as well. Hydraulics; The system that provides power to operate the controls wheels and brakes. It is the system used on cars for power assisted steering and brakes. ILS; Instrument Landing System. 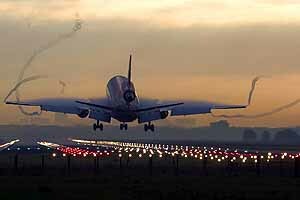 Radio guidance for aircraft to align them with the runway, when it is sufficiently accurate it is also used to allow aircraft to do automatic landings and blind landings. Inertial navigation; Navigation system which calculates position by integrating speed and direction and wind effect and comparing with known ground reference points. In-flight computer; Electronic equipment which controls aircraft systems. Nothing like personal coputers. Irrational; Behaviour that is not related to rational reasoning. Intermediate approach; Part of the flight between completing the descent and before starting the final approach. Ice prevention; Is by using the systems available , either hot air, electrical heating or mechanically by rubber ‘boots’ that expand and contract to break ice off the front of the wings. Instrument flying; Controlling a plane by using the instruments and not by looking out of the pilots’ window. Most commercial flights take place like this. Instrument Rating; A qualification that all commercial pilots have to have. Considered the most difficult test of all the checks and tests that pilots ever have. Consist of a flight lasting about 40 minutes where the pilot flies by using only his/her instruments except for the take off and the touchdown. As difficult as driving your car for 40 minutes without letting the speed vary by more than 2 miles per hour, position on the road by more than 3 feet and observing and obeying every road sign, using flickers, lights, horn, handbrake/park brake absolutely correctly at the right time etc etc. About 5 times harder than the Advanced Motorists Test in the UK. The most significant qualification that a pilot ever achieves. 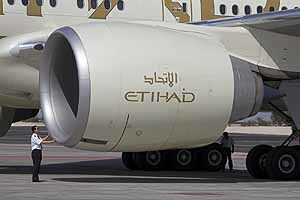 Jet engines; An engine which provides thrust by … (Premium) …through a smaller nozzle at the back of the engine. Jet lag; The problems associated with crossing time zones. Jet fuel; Is like domestic paraffin but highly refined and prepared. It usually has a freezing point of about -40C K.
Kerosene; Another name for aviation fuel. Kite; A tethered flying device which relies upon the wind to support it. Knot; A speed used in navigation approximately 15% … (Premium) …the number of knots in the line that unspooled from the reel of a chip log in a specific time. Landing phase; The part of the approach between where the pilots have decided to land and the completion of slowing down on the runway and starting to taxi to its parking location. Latitude and Longitude; The method of referring to a position on the earth’s surface. 90 degrees latitude is at… (Premium) … zero degrees latitude. Longitude is East or West of Greenwich. 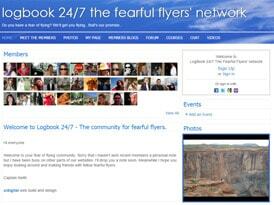 Life changing event; In connection with a fear of flying. An event which causes extra stress above normal events and can relate directly to a change of attitude towards risks and perceived risk. Lift; Upward force … (Premium) …passing over it at speed. Lightning; Static electricity generated … (Premium) … cause damage. Maintenance; A schedule of engineering inspection and rectification according to the number of hours a plane has been flying or the number of landings that it has done. Maximum take off weight; The the maximum … (Premium) … aircraft can take off. Movements; Of the aircraft … often upsetting to the passengers because of the accelerations of the plane and the fact that you sometimes cannot see out of the window. Media; Probably the best way of getting ideas and thoughts to make your fear of flying worse than it is. Mach Number; Mach 1 is the … (Premium) … modern jet is about .84 which means the plane is flying … (Premium) … sound. Mandatory Requirement; The legal and statutory framework laid down for the Licensing of pilots, engineers cabin crew and ATC controllers. Usually on a six monthly or annual training requirement. NLP; Neuro linguistic programming a process for re- evaluating circumstances by changing thought patterns. Navigation; The controlled movement of an aircraft. Or the science of calculating position by using speed and direction and wind effect. Nearmiss; … (Premium) …not the possibility of collision. See TCAS. Negative beliefs; Beliefs that mitigate against achieving a particular behavior. No smoking signs; Cabin indicators operated from the flight deck to show that smoking is NEVER permitted on board. Normal; Flying and aviation in general. Never exceed speed; The maximum speed an aircraft is allowed to fly at. Known to pilots as VNE. Oxygen; The part of air that is required to sustain life. Oxygen is carried on board for medical puposes and is available to individual passengers via masks in the event of loss of cabin pressure. Optimum altitude; An airliner has an optimum height at which to fly according to its weight although there are restrictions and variations to this because of ATC or weather or winds. Operational procedures; The laid down and legal procedures which an airline has to conform to in every aspect of its business. Panic attack; State of mind … (Premium) … occurs. Panic; State of mind where thought normal processes are … (Premium) …fear and doom. Parking; The period when the aircraft is being aligned and positioned prior to stopping. Personalising; The process of believing that because something that has happened to someone else it will happen to you. Phobia; Irrational fear Physiology; The science of the functions of a body. Pilot; Person who is licensed to fly an aircraft. Pitch; The angle of the nose of the aircraft above or below the level position. Point of no return; Incorrect description of … (Premium) …take off. Position; Of an aircraft … in relation to Latitude and Longitude or in a procedure laid down to depart from or arrive at an airport or navigational route. Positive beliefs; Beliefs that assist in achieving a particular behavior. Possibility; Things that could happen. … (Premium) … mean it will happen. Post traumatic stress disorder; Behavioural and psychological reaction to a disturbing event. Probability; The likelihood of something happening expressed numerically. Problem-solving; A system of … (Premium) …outcome from a previous set of conditions. Psychology; The science of human behaviour. Pitot tube; The orifice into which air flows to register the speed of the plane. QNH; A setting on an altimeter which shows the height … (Premium) … in that area. QFE; A setting on an altimeter which shows the height … (Premium) … or runway. Radar Control; The time when an aircraft’s progress is controlled … (Premium) …radar set. RAT; Ram air turbine a device … a small … (Premium) …like device that is dropped into the airflow which provides hydraulic or electrical power. Situated under the belly of the aircraft. Rational; Based on logic and reason. Refuelling; Process of puting fuel on an aircraft. Done under very strict regulations and quality control of the fuel. 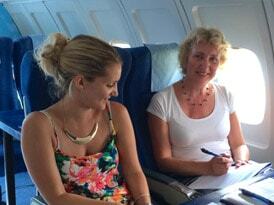 Aircrfat can be re-fuelled while passengers are boarding subject to very strict rules. Relaxation; Period of time when there are no demands on the time energy or mental effort of a person. Resultant behaviour; Behaviour as the result of a prior event. If regular it is known as classical conditioning; If ‘this’ happens … then there is a predictable and consistent reaction. 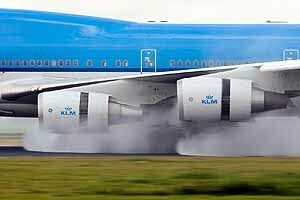 Reverse thrust; The use of the engine power to … (Premium) …The engine does not run backwards. Risk; The difference between a threat and the defenses offered to minimize the effects. Routine; Regular process and procedure laid down to produce a particular outcome. Rudder; The vertical part at the back of the aircraft which keeps the aircraft … (Premium) …like a … (Premium) … vane. Safety; A culture in which the airline industry operates. Safety briefings; The … (Premium) …to passengers, given by licensed members of the crew. Self Help; Applying strategies and behaviours to bring about a required change. Sick bag; A bag legally available for use by passengers who are likely to be sick. Slats; Part of the flap system which extends on the front of the wing and when extended increases the lift on a wing. Sleep pattern; The trend over a period of time which identifies the times and quality of sleep. Sleep; The time spent recovering from conscious activity. 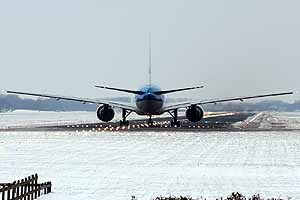 Snow and ice protection : Ensuring that the plane has no icing contamination. Spacing; The distance that air traffic control … (Premium) …are flying at. Stability; Of an aircraft is its built in tendency to return to level flight. Static wicks; … (Premium) … static electricity into the air. Stop speed; (See) V1 … (Premium) … in the event of an engine malfunction. Stratus; Form of low cloud associated with light rain and drizzle. Stress inducing ideas; Thoughts which increase the stress on a person. Stress; Is the feeling caused by a perception that you are not able to meet the demands of the occasion. Supporter; Someone who can give regular help and assistance to a person who has a fear of flying. Tail plane; Parts at the … (Premium) …sideways and up-and-down movements. Tail wind; A wind speeding up the progress of an aircraft over the ground. 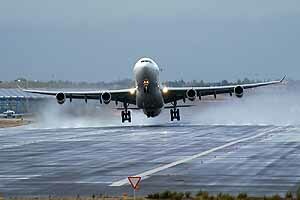 Takeoff; The procedure to get an aircraft airborne from being stationary. Taxing; Maneuvering the aircraft on the ground under its own power. TCAS; Stands for Traffic Collision and Avoidance… (Premium) …avoid conflicting aircraft. Technical delay; A delay caused by… (Premium) …. Technical log; The book which contains … (Premium) …for a particular aircraft regarding it’s technical status. 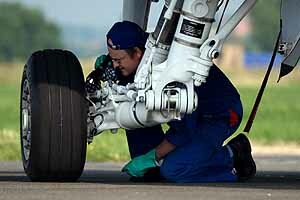 Technical problem; Often said by the flight crew or ground crew when the aircraft is … (Premium) …with the plane etc etc. TFT; Thought field therapy. A process of tapping the bodies meridians to bring about changes of thinking and behaviour. Thought stopping; A process of interrupting unhelpful thoughts for example snapping an elastic band on the wrist or shouting “STOP”. Threat; Something that is likely to endanger. Resisted with defences … THE RESULT OF WHICH PRODUCES RISK. Thrust levers; The levers in the cockpit which control the amount of power from the engines. Time; Alpha and Zulu the first being local time and the second Greenwich Mean Time. Time zone; A geographic area which has a common local time. Touchdown;The point or time at which the aircraft’s wheels touch the runway. Training;. All aviation training has to be performed by … (Premium) … levels of facilities. Traumatic life event; A bad experience of a flight or events surrounding a flight. Or something of a personal nature that has an influence on life. Triggers; Words or actions times or places where certain procedures are actioned. Trim; A flight control system which allows the pilot to fly the aircraft without having to resist or apply a force to the control wheel or stick. Turbo prop engines; A jet engine with a propeller on the front of it. It enjoys the benefit of good low speed performance and the economy and power of a pure jet. 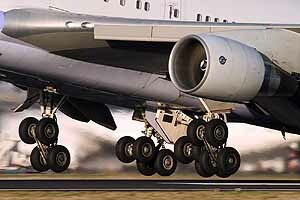 Undercarriage; The landing … (Premium) … hydraulic motors. Unstable air; Air which instead of cooling as it rises becomes relatively warmer. See weather. Uniform; Still used even in these less formal times so that the crew can be identified by the passengers if there is an emergency. V; A symbol for defining … (Premium) … to an aircraft at certain stages of flight. V1; The speed on … (Premium) … aborting the take off. V2; The speed at which the aircraft would climb if it had an engine failure on take off. Variable; Used to describe a wind direction for aircraft taking off or landing. Vector; Part of a force which … (Premium) … a desired outcome. Velocity; A movement which has speed and direction. Victor; Phonetic pronunciation of the letter V.
VR; The speed at which the pilot … (Premium) … take off. Watery foods; Foods with a high water content such as fruit. Weight and balance chart; The … (Premium) … documentation which shows that the total weight. Yankee; Letter of the phonetic alphabet. Yaw Damper; Device fitted on a plane to automatically reduce the effects of yaw when the aircraft is affected by such things as gusts. Zero flight time; Pilot training which is performed solely on flight simulators. Zero fuel weight; The maximum allowable weight of an aircraft without fuel. Zulu; Is the abbreviation for Greenwich mean time as opposed to local time. Zulu; The last letter in the phonetic alphabet.